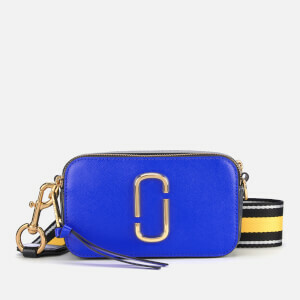 Fluorescent yellow 'Snapshot' cross body bag from New York fashion house, Marc Jacobs. Crafted from durable textured leather, the camera bag comprises a dual-compartment structure secured by a pair of zip fastenings with elongated pull ties. Slip pockets feature to the interior and rear of the bag, while an adjustable canvas strap with jacquard branding can be removed to create a clutch for versatile styling. The iconic ‘Double J’ logo appears at the front in silver-toned metal. Embossed branding. Includes dust bag.